The Aṭṭhakavagga and the Pārāyanavagga are two small collections of suttas within the Pāli Canon of Theravada Buddhism. They are considered by some modern scholars to be among the earliest existing Buddhist literature. We do not have a great deal of information about the earliest phases of Buddhist thought, the form of the religion predating its later codification in the established canons and practices of the Early Buddhist schools and later innovations like the Mahāyāna. Some texts, however, have been identified by scholars as being earlier than others; for example, in the Sutta Nipāta, which is a branch of the Khuddhaka Nikāya of the Sutta Piṭaka in the Tipitaka, there are two small collections of suttas, the Aṭṭhakavagga and the Pārāyanavagga, which scholars regard as being considerably earlier in composition than the bulk of the canon, and which reveal an earlier form of the religion.1 They are regarded as earlier because of elements of language and composition, their inclusion in very early commentaries, and also because they seem to express versions of certain Buddhist beliefs that are different from, and perhaps prior to, their later codified versions.2 The Khaggavisānasutta (Rhinoceros Sutra), also in the Sutta Nipāta, similarly seems to reveal an earlier mode of Buddhist monasticism, which emphasized individual wandering monastics, more in keeping with the Indian sannyāsin tradition. A relatively complete version of the Rhinoceros Sutra was included in the group of texts discovered in Gandhara in 1994, which are the earliest Indian manuscripts discovered; textual material from the Aṭṭhakavagga and Pārāyanavagga was also represented in the Gandhara find. Speaking generally, the Aṭṭhakavagga and the Pārāyanavagga tend more strongly to emphasize the negative sides of asceticism (i.e., asceticism as a process of negating desire), and show a strong concern with regulating everyday bodily activities and sexual desires. They also place considerable emphasis on the rejection of all views, and are reluctant to put forward positions of their own regarding basic metaphysical issues. This has caused some commentators (Gomez 1976) to compare them to later Madhyamaka philosophy, which in its Prasaṅgika form especially makes a method of rejecting others views rather than proposing its own. The Aṭṭhakavagga and the Pārāyanavagga also differ in their articulation of Buddhist meditation practices, leaning heavily on what would come to be defined as samatha and showing very little evidence of vipassanā at all, despite the important role played by the balance of these two elements in later Buddhism. This seems to be connected to the rejection of views, for if there is no correct view to gain insight into, meditation would be conceived simply as the practice of cultivating a mental state devoid of views. 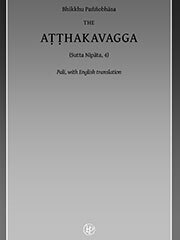 Thus the ultimate meditative object expressed in these texts, «akiṅcañña», «Not-any-thing-ness» (i.e., total negation), which of course begs comparison to the Madhyamaka ideal of śūnyatā. After Gomez had proposed these texts as a sort of proto-Madhyamaka, a leading Dutch Pali scholar, Tillman Vetter, re-examined the evidence. Although agreeing overall with Gomez’ observations, he suggests some refinements on historical and doctrinal grounds. First, he notes that neither of these short collections of suttas are homogeneous and hence are not all amenable to Gomez’ proposals. According to Vetter, those suttas which do lend support to Gomez probably originated with a heterodox ascetic group that pre-dated the Buddha, and were integrated into the Buddhist Sangha at an early date, bringing with them some suttas that were already in existence and also composing further suttas in which they tried to combine their own teachings with those of the Buddha. Thus if both Gomez and Vetter are correct, Madhyamaka would represent a continuation of a heterodox strand within Buddhism, rather than either a totally or largely orthodox one, as held by some scholars.